​Retreat Farm in Brattleboro is excited to host the nonprofit Farm to Ballet Project for the third year. Come early and enjoy our Children's Farm & Forest program, visit animals in the barn and on pasture, walk through the Children's Garden and Nature Trail, and enjoy indoor and outdoor play spaces. 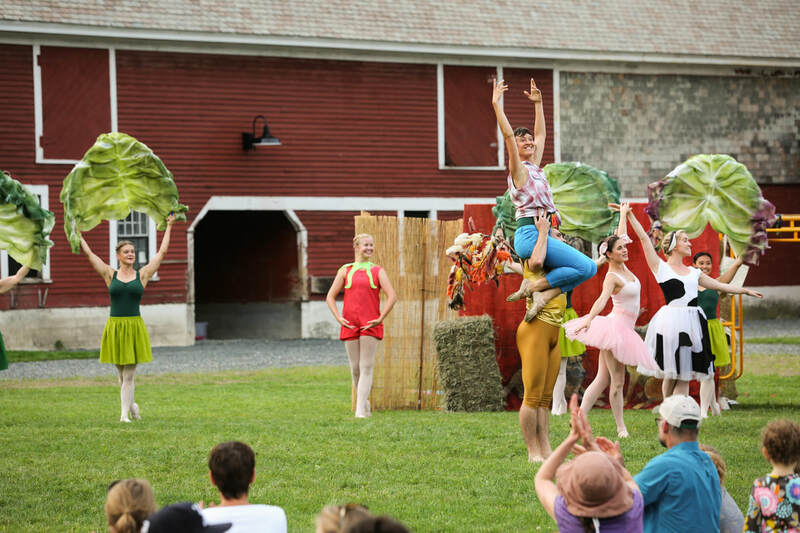 Come early to enjoy the grounds, listen to music and see the pre-show performance!​​ The Children's Farm & Forest will be open for guests to enjoy from the time the gates open at 4:30pm until the start of the ballet. Retreat Farm's portion of the ticket sales will directly benefit the Open Barn program, which provides reduced admission and memberships to families that participate in EBT, Medicaid, or Free/Reduced School Lunch programs. This popular new program is designed to keep our educational resources accessible to everyone in the community. Before the show, guests can tour the Children’s Farm and Forest, which includes hands-on animal interactions in an indoor barn, animals on pasture, creative play areas, and a .75-mile interpretive nature trail. Our learning center and gift shop also provide an opportunity for visitors to purchase farm products, local art, and educational toys and books. Balloon and face painting artists will also be onsite, while Carlos our majestic 1-ton ox looks on from his paddock to the south of the Square. Don’t miss the pre-show performance at 5:30pm where Farm to Ballet campers will debut the choreography and costumes they crafted during the week of camp! Follow Retreat Farm on social media! We are conveniently located off Rt. 30, just northwest of downtown Brattleboro. How to Find Us: From I-91, take exit 2 and turn east on Western Ave. Follow signs to VT Route 30 North. Retreat Farm is a non-profit center for land-based education, recreation, and farming - where people connect to the land and each other. Founded in 1837, the Farm historically provided the food, fuel, and outdoor therapies for the Brattleboro Retreat. Today the Farm is comprised of 500 acres of farmlands, forest, and wetlands, and is the heart of the nine-mile Retreat Trails network. Retreat Farm is home to the Children’s Farm & Forest, a farm-based educational experience whose mission is to instill a love of the natural world through farming, play, and hands-on exploration. Your Farm to Ballet tickets will directly benefit the Open Barn program, which provides reduced admission and memberships to families that participate in EBT, Medicaid, or Free/Reduced School Lunch programs. This is a popular new program designed to keep our educational resources accessible to everyone in our community.